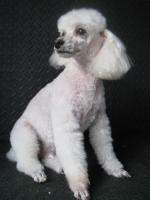 In addition to our Groomer Training we offer a professional grooming service. In an initial consultation with one of our groomers we will establish with you the best style to suit yours and your dogs lifestyle. All styling services include nail trimming and ear cleansing. We use only top quality dog shampoos and conditioners and these are carefully selected after an examination of the dogs coat. We are definitely not a 'one clip fits all' operation, and are able to produce a 'head turning' showy clip, an easy low maintainance trim, or anything in between. Should you have any questions about your dogs grooming requirements or wish to book an appointment then contact us on Tel: 0161 427 9802.